Following is a short summary of my experience with the “Chuck and Nancy Missler Israel Tour.” I kept a short journal each day of some of my thoughts and impressions during that day. The following is in NO WAY complete of everything that occurred on the tour. That would be a book in and of itself. It is just a collection of thoughts and some pictures that attempt to bring a visual aspect to the writing. The links are generally to “jpg” formatted files. After viewing the graphic, press the “Back” key on your browser to return to this summary. Most of Saturday and Sunday was spent travelling. Arrived in Tel Aviv around 8:00 p.m. We were notified that earlier in the day there was an Hamas suicide bombing in Jerusalem. Off to the hotel in Netanya, just north of Tel Aviv on the coast. Today's itinerary: Caesarea, Mount Carmel, Haifa, Acco, Nazareth and Cana. 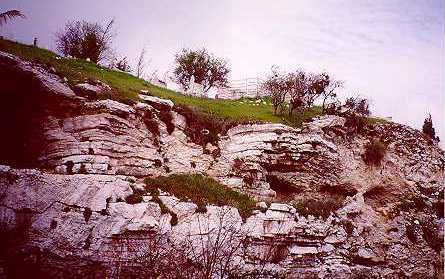 Mount Carmel where Elijah had the confrontation with the priests of Baal (1 Kings 18). We had a study here lead by Chuck Missler. Nazareth, where Gabriel announced to Mary and Joseph about the birth of Jesus, where Jesus grew up, and we saw the likely hill that the Nazarene crowds attempted to throw Jesus off of (Luke 4:16-30). What struck me most today was that many of the spots were fairly modern. For example, Nazareth looked like any of the other modern towns we passed through, except for that hill (see above). Mt. Carmel looked over the large city of Haifa. We also learned that there was a horrible suicide bombing that afternoon, killing many, many Jews today. Two bombings in two days. We talked that night with some of the men in Tiberia on the Sea of Galilee. While it was the second bombing of our trip, it was the fourth in a few weeks. The men felt that they were in the middle of a war that they couldn't fight. Hamas suicide bombings killing their children and loved ones. It sheds a different perspective than you get from watching the nightly news. Today's itinerary: Sea of Galilee, 2000 year old boat exhibit, Banias Waterfalls, Jordan River baptisms. took a boat ride on the Sea of Galilee, which included some worship and a Bible study by Chuck, focusing on Peter and his short walk on this body of water. 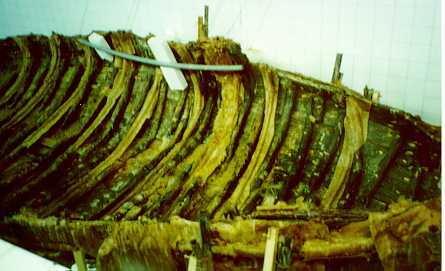 visited an exhibit of the 2000+ year old fishing boat that was discovered in the Sea of Galilee a few years ago. had lunch at a kibbutz (by the way this was the best lunch of the entie trip - absolutely great food and friendly people. 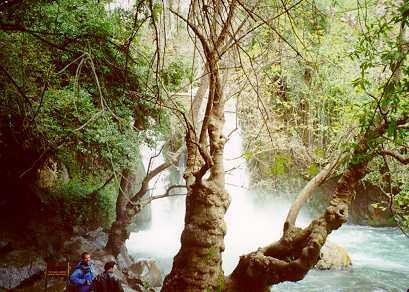 visited the beautiful Banias Waterfalls which are one of the sources of the Jordan River north of the Sea of Galilee. ended the day with several baptisms in the Jordan River. after dinner Chuck had a two-hour question and answer period. The Sea of Galilee (really more of a lake than a sea) was very peaceful today. From the boat you could look around the harp shaped lake and see the spatterings of towns and cities around it. The lake is about 13 1/2 miles by 7 1/2 miles. At the surface of the water, you are about 680 feet below sea level. From the Gospels we know that many things occurred here: the calling of the apostles (Mat. 4:18-22), teaching of the multitudes (Luke 5:1-3, 8:4-18), calming of the storm (Mark 4:35-41), Jesus walking on the water (Mat. 14:22-23) and appearance of the Lord after His resurrection (John 21:1-23) to name just a few. From the boat we could see the Mount of Beatitudes which we'll visit tomorrow. Appears to be a very peaceful place, very green and a small area of large trees. Today we visited the Golan Heights. I didn't really understand the geography from the newscasts. 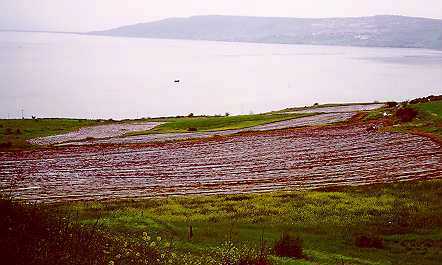 This area is on the hills overlooking the northeastern portion of the Sea of Galilee. We travelled along the Israel - Jordan border and could see Syria in the distance. We passed abandoned Syrian bunkers along the way to a kibbutz at the a summit overlooking Galilee. when the Golan Heights was under Syrian control they shelled an Israeli kibbutz on the coast of Galilee every day for nineteen YEARS! The children grew up sleeping in bomb shelters. One of the abandoned heavy artillery guns still stands pointing at it's target. Knowing this and the fact that the Sea of Galilee is 1/3 of the country's fresh water supply, it's little wonder why the Israeli populace doesn't want to give up the Golan Heights. For me the Mount of Beatitudes was the most spiritually moving place at this point in the tour.. 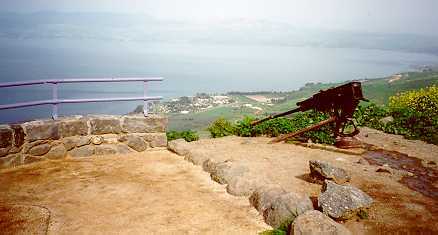 The mount overlooks the Sea of Galilee, and is today just large amount of green fields and some farm land. A certain area on the mount makes a natural amphitheater, where you can easily imagine the Lord giving the Sermon on the Mount. Except the movies always portray the Lord at the top of the Mount speaking down to the crowd. 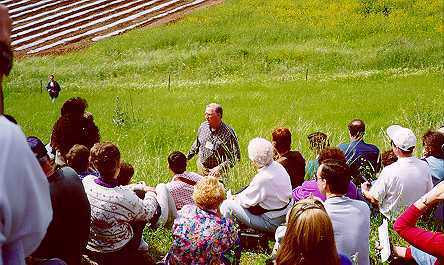 The natural amphitheater aspect here makes it more likely that He spoke from the base while the crowds sat around Him. But as with many of the sites in the Holy Land, you can only speculate on exact locations of events, but general locations are known, and some spots have high probability of authenticity, due to historical records and other topographical features (more on that when we get to Calvary and the tomb). I guess it doesn't really matter whether the actual spot of the sermon was 200 feet one way or the other. And I am glad we didn't pay very particular attention on the trip to churches that claim to be on the EXACT spot; especially when there are two or more of them claiming to have it! 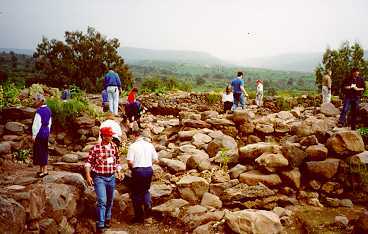 We had the chance to visit the newly discovered—about 9 years ago if I remember right—ruins of Beth Saida. We were the first of the general public to see the ruins (our tour guide had connections). The site still isn't ready for general tours because we had to climb some pretty rough ground to get there. They have to create a path before they allow general visits. 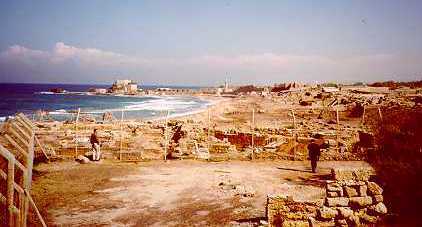 The site which contained ruins from two floorplans of fishermen's houses. They found jewelry, vessels, items that would be consistent with a fisherman's town. This was a well publicized find and a best-selling book (in its field) about the discoveries. Probably the most striking thing to me today was travelling through the valley of Megiddo (this is where the Battle of Armageddon will occur - Rev. 16:16). What struck me was that looking around at the surrounding mountainside, there on top of a hill in very plain view is the city of Nazareth. I thought about the possibility of the Lord sitting in Nazareth looking down upon the plains where that final climactic battle will take place. Imagining Him sitting on a nearby hillside discussing with the Father what was to occur. I guess it's just one of those things that hit your mind and spirit, when you realize that you are in the middle of a land that God has reserved for Himself, and how much has happended here in history and what is still to occur. Jericho and Bethlehem are under PLO control now with the lastest “peace process” accords. Our tour bus was allowed to drive through the current city of Jericho which is a few miles away from the ancient site, just north of the Dead Sea. Jericho is believed to be the oldest city known to man. We weren't allowed to get off or go to the old site. In fact, if we hadn't been on a tour, we wouldn't hvae been allowed in. 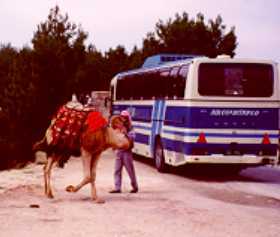 In Bethlehem, we were allowed to exit the buses, proably due to its proximity to Jerusalem (about 5 miles south). In ancient Bethlehem we read about Ruth and Boaz, ancestors of Mary and Joseph (Book of Ruth), and also the place of Rachel's tomb (Genesis 35:19, 48:7). We ended the day with our arrival in Jerusalem, one of the focal points of the tour. Jerusalem will be our headquarters for day trips in and around Judea. After the fall of Jerusalem about 70 A.D., Masada represented the last Jewish resistance to Rome. Jewish zealots overtook the Roman garrison located here, where once Herod's stood Herod's great winter palace. 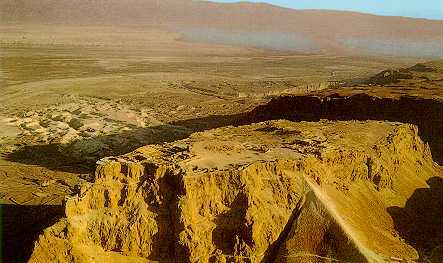 The palace was located on top a plateau 1300 feet above the Dead Sea. There were cliff walls encircling the top of the plateau. Only a very narrow trail lead from the bottom of the mountain to the fortressed palace above. 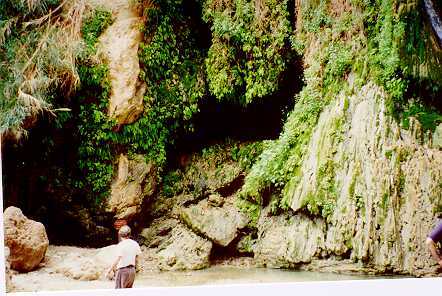 Ein Gedi is a beautiful little oasis out in the Judean desert, supplied by an undergound river from near Jerusalem. In the caves surrounding this area is where David hid from King Saul. (1 Samuel 23:29, 24:1; 2 Chronicles 20:2). It is amazing to see a lush green oasis here in the middle of a vast desert. 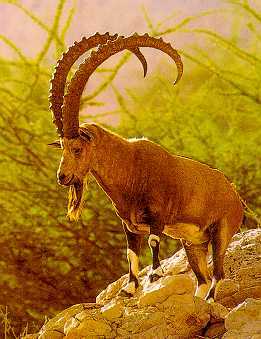 There are also small herds of Ibex (mountain goats) sourrounding the area. Qumran is the system of caves in the desert near the Dead Sea where the Dead Sea Scrolls were found in 1948. Various scrolls have been dated between 100 B.C. and 68 A.D. They are considered the most important Biblical archaeological find of the 20th century. They provide tremendous assurance of the accuracy of the Old Testament as passed down through the centuries. 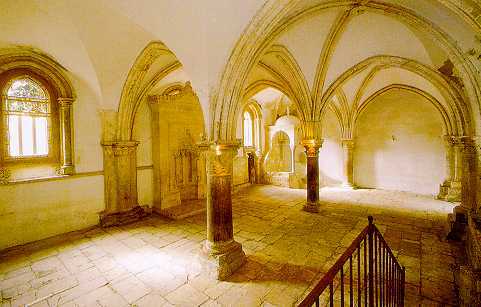 The room believed to be the site of the Last Supper. 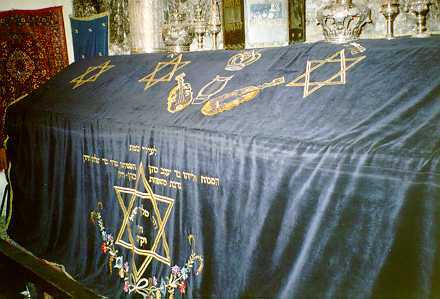 Very near the Upper Room is the tomb of King David in the Old City. Some archaeological ruins within the city (actually underneath the city - about 27 feet underground). Spent the afternoon in the hotel discussing the Holy Land and our Lord with our good friend, Lambert Dolphin. Visit Lambert's site and read of his adventures in the Holy Land and much, much more. Or you may wish to read a short history of the city of Jerusalem and the Temple Mount that Lambert prepared in 1983 for the Jewish Temple Foundation. 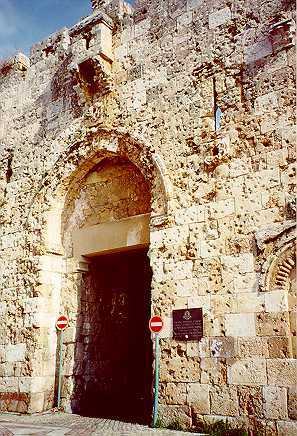 Here's a picture of the Zion Gate into the Old City of Jerusalem. The pock marks are bullet holes from the War in 1967. One thing you notice around the Old City, is the presence of Israeli Army and Police. No wonder considering the recent bombings. While travelling around the city we noticed two armed guards at just about every bus stop. 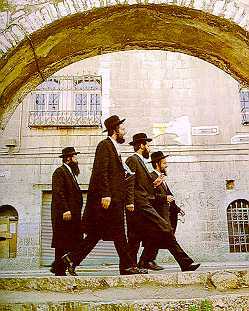 They were patrolling the streets of the Old City in groups of two or three. And they surrounded the Wailing Wall area. You'll also see lots of Orthodox Jews in Jerusalem, especially near the Wailing Wall. I have heard a lot of studies about the Temple Mount, with respect to the rebuilding of the Temple. It is interesting to actually see this site. There are three basic theories about where the Holy of Holies of the First and Second Temple actually resided. Which is important to the Jews, in that they feel they must rebuild the temple in such a manner that the Holy of Holies is at the same spot (which is supported Biblically). 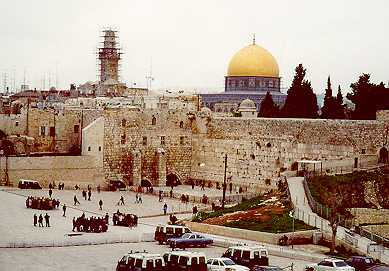 If you would like more information on this area visit www.templemount.org. Briefly, the traditional view is that the Holy of Holies is below the existing Dome of the Rock Mosque, and therefore would have to be gone in order for the temple to be rebuilt. The other two theories place it just north of the Dome of the Rock Mosque or just south it. The southern viewpoint is the most recent theory based not so much as archaeological ruins, but on historical architectural descriptions. If the southern viewpoint is correct, the Holy of Holies would be between the two Moslem mosques, and could be rebuilt without touching either one. The dome of the Dome of the Rock Mosque is plated in gold. It is being refurbished and supposedly paid for by King Hussein of Jordan. Visitors are allowed inside, although I didn't make it inside. From the Mount of Olives, just opposite the Old City, you get a great view. Also a good point to take some pictures of friends. This is the location where Jeus wept over Jerusalem (Matthew 27:37-39). This is where the Lord was standing when He ascended to be with the Father (Acts 1:1-12) and where He will return at the end of the Tribulation (Zechariah 14:4). The Garden of Gethsemane at the base of the Mount of Olives still has olive trees that are 1900+ years old. Historical accounts say that Titus destroyed all the olive trees when he destroyed Jerusalem in 70 A.D. So these must have been replanted probably from the roots of the then existing trees. This is where the Lord was betrayed by Judas and taken into custody. (Matthew 26:47-56). From here, you also get a good view of the Golden Gate (Eastern Gate) area where Jesus rode the donkey into the temple area in His triumphal entry (Matthew 21:8-11). The actual walls seen here are from the Byzantine era (7th century A.D.) but are built over the gate that existed in Jesus' time. Tuvia Sagiv gave a talk about his theory on the site of the Second Temple, which is known as the Southern Viewpoint. David Terasaka, M.D. gave a talk about the “Medical Aspects of the Crucifixion of Jesus Christ.” Dave has graciously made his notes available on-line for your viewing. Today's itinerary: Rabbinical Tunnel, Golgotha (Calvary), the Empty Tomb. We started the day at the Wailing Wall again. Today being Monday, it was bar mitvah day at the Wailing Wall. A lot of celebration around the Wall area. We went into the Rabbinical Tunnel, which runs along the Western Wall, from the Wailing Wall area to the other end where it is believed that the Antonia Fortress was. The tunnel is further underground than the worship area of the Wailing Wall. (About half of the Wailing Wall is underground, i.e., the wall at the worship area still goes another 50 feet down below current ground level). In the Rabinnical Tunnel you can see the Western Wall stones from Herod's time, some even believe that they are from the time of King Solomon. They are HUGE stones that make up the wall in this area. 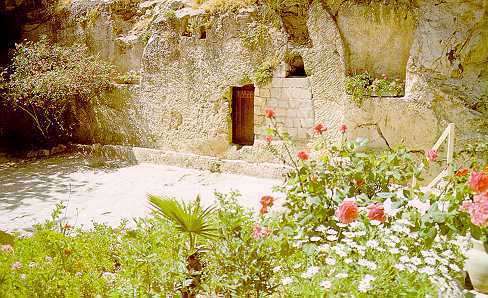 There are a couple other sites where some believe the tomb was... they have churches built on the site. Based upon my assessment of history in this area, this means to me that either of these other sites almost surely NOT the location. For those not going on to the Jordan portion of the tour, today was the last day. We had a farewell dinner with everyone, prior to the departure of those returning home. The rest of us got ready for our three days in Jordan and moving our home base to Ammon, Jordan for our trip to see the ancient city of Petra, and also a city of future prophetic happenings. The first and last day were spent travelling to and from Ammon, Jordan. On the way there we stopped at Mt. Nebo, where the Lord took Moses and showed him the Promised Land. Mt. Nebo is in Jordan, but from the summit you can see the towers in the Old City of Jerusalem. Looking backwards is the desert of Jordan, but looking westward, you can see the fertile green valleys of Israel. It was here that I got a picture of an old and new method of Middle Eastern transportation. On Wednesday, we took the bus ride to the ancient city of Petra (a 3+ hour bus ride one way). 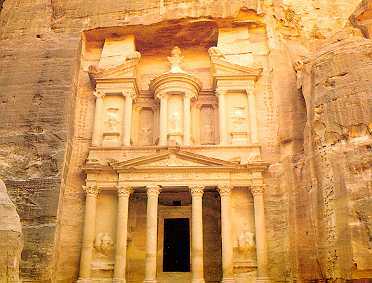 Petra is lcoated southeast of the Dead Sea in the region of Edom. The original building of the fortress city was somewhere about 2,000 B.C. by the Horites. Descendants of Esau moved here later on. 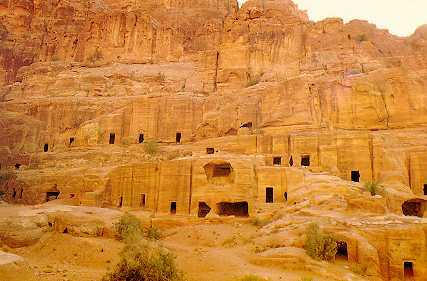 About the 6th century B.C., the Nabateans took the city and made it their stronghold. To enter the city you must walk a dirt path over 6,000 feet long, ranging in width from 12-30 feet. The cliffs totalling surrounding the path range from 100-500 feet high. The place is a natural rock fortress. Once into the actual city you see a huge facade carved into the rock. It appears to be about the equivalent of a 5-6 story building. They say it took 250 years to carve. If it looks familiar, it's because a portion of one of the Radier's of the Lost Ark movies was filmed here. There are carved water systems, cisterns, dwelling caves and a Roman looking amphitheater existing in the actual city area. The city appears to have been lost from the sight and memory of man from about 70 A.D. until 1812. However, many believe that this city is the prophesied Edomite city where the believing remnant of Israel will escape to during the Great Tribulation, and be safe from the power of the Anti-Christ. Adherents point to the fact that it is an existant city just waiting to be occupied, that it clearly is in Edom (as prophecied), and that it's natural fortress qualities, will make it easier to defend than other sites. (See Matthew 24:15-21; Revelation 12:6, 13-14; Psalms 60:1,9-12 and Daniel 11:40-41). Thursday brought the end to our tour. President Clinton was in Jerusalem for the hastily called summit to combat terrorism in Israel. Therefore, getting back to Tel Aviv was an absolute mess, because of the security procedures all over the country. But we made it to the airport for our midnight flight home. It is really impossible to put into words the spiritual impact of this type of tour. The foregoing was an account of the events that occurred. But to see the topography, the closeness of locations and the feel of the country is not able to be put down in pictures or even video. Reading about Palm Sunday and being able to recall the distance from where Bethany was to the Eastern Gate will be more real. 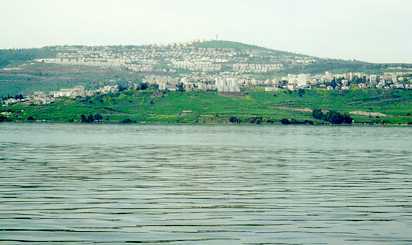 When I now read about the Sea of Galilee, Peter being called by the Lord to walk on water, fishing boats, the Mount of Beatitudes; these will mean so much more. So I must thank the Lord for providing the means for the trip. And I encourage you all to take a tour of the Holy Land! One of the very pleasant aspects of the trip was sharing it with my friends, and making new ones while on the tour. Here are some pictures of some very special people. If you would like some information about the next Chuck and Nancy Missler Israel Tour, contact Compass International, 460 West Canfield Drive, Suite 1000, Coeur d'Alene, ID 83814, or by phone 800-977-2177, or by e-mail billp@compass.org. © JoshuaNet.org. All Rights Reserved, Jim Milligan.